Are you using your autoresponder to it's fullest potential? 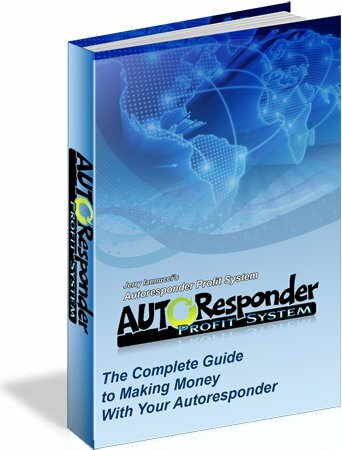 You've probably been told that having an autoresponder is the fastest way to building a true autopilot income on the Internet but it amazes me to see how many people are are paying high monthly subscription fees for an autoresponder they don't even know how to use. I know because I did exactly the same thing. The first time I subscribed to an autoresponder service I had dreams of building downlines of thousands of members in my organization completely on autopilot. I just assumed my autoresponder would do all the work for me and I could simply sit back and collect all the money. Obviously I was disappointed to find out that it's not quite that easy. It wasn't until a few years later that I started to understand why using an autoresponder was so important. It was around this time that I started meeting a lot of people who were making a lot of money with "list building". I understood the basic idea of buiding a list but I had no idea how to start a list much less what to do with a list once I had it. It took me a long time and more money than I care to admit to figure it out but I am happy to say that today my autoresponder is earning me more money than I ever thought was possible. And that is why I decided to write this book. What you have here is an easy to follow roadmap that will show you exactly what I did to turn my autoresponder into a way to make money every single day with very little effort. This information comes from my own personal experience and is filled with techniques that have been proven to work for myself and many others. How to Unlock the True Potential of Your Autoresponder to Start Earning a Full-Time Income that Never Goes Away. Proven List Building Techniques that will Put New Subscribers on Your List 24 Hours a Day, 365 Days a Year. How to Quickly and Easily Create Your Own Products That Will Make You Look Like a Superstar and Have People Lining Up Around the Block to Join Your List. The Easiest Way to Design a High Converting Lead Capture Page That Won't Require You to Know Anything About HTML or Webdesign. How to Leverage Your List to Start Generating Multiple Streams of Income That Will Put Money in Your Pocket Over and Over Again. Where to Get the EXACT Same Tools and Resources the Heavy Hitting Gurus are Using to Skyrocket their Sales... for FREE. "Having an autoresponder is NOT enough. to create maximum profits, and more. "If you haven't read Jerry's APS book yet, do it NOW! You will be happy you did. It's packed full of excellent information from setting up your lead capture page to your front and backend offers. As well as your email series etc. This is information you need to know in order to succeed at listbuilding and Jerry has it all in this one ebook. Well done Jerry!" "This is an absolutely astonishing book! An absolute must read for anyone who really wants to succeed in this business. Jerry is at the forefront of email marketing in our industry and definitely delivers in this new ebook full of the best content I have seen regarding list building and email marketing!" "I've been using autoresponders to market my business for over 6 years now and this is one of the most comprehensive and easy to read books that I have read on the subject! Your book is suitable for newbies but also covers techniques that will benefit people who have been using autoresponders for a while. Great work and I can't believe you are giving it away for free too!" "As having a Autoresponder and building a list is crucial to be successful online, Jerry has put the best training I have ever read when it comes to this matter. Simple to follow and straight to the point. The tips and techinques expaining on his ebook works like magic. I definitely recommend getting a hold on this if you want to make the best out of your autoresponder and start building a profitable list." Click the Button Below to Claim Your Free Download Now!